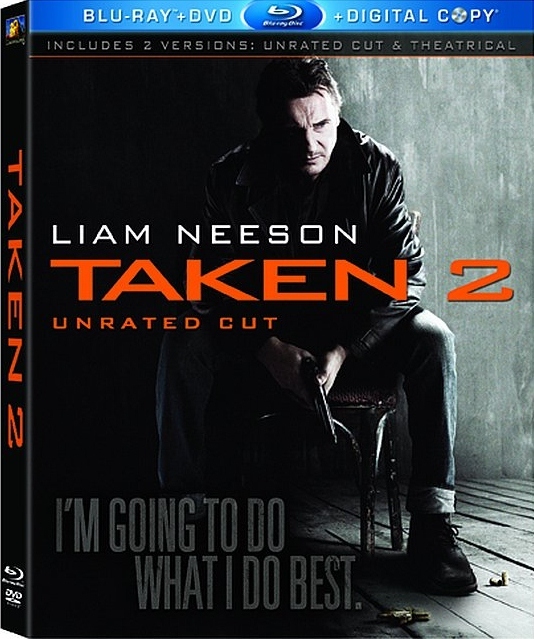 The blockbuster sequel Taken 2 will bow on Blu-ray and DVD January 15, 2013 from Twentieth Century Fox Home Entertainment with a slew of extra features that look pretty enticing. The Blu-ray will include both the theatrical cut and a new Unrated cut. Other features include something called the “Black Ops Field Manual,” the interactive feature “Tools of the Trade,” deleted and extended scenes, a special effects featurette, and perhaps most intriguingly – a 20-minute alternate ending. Now that should be interesting. The DVD version contains the theatrical cut along with the alternate ending and FX featurette. Taken 2 was produced by Luc Besson, director of the original Taken, and directed by Olivier Megaton (Colombiana, Transporter 3). Fans of Bryan Mills and his “particular set of skills” (an audience that has pushed Taken 2 to a $360 million worldwide gross) will certainly want to mark their calendars for January 15, 2013. More coverage to come!